Description: Huntingdonshire, from the second edition of Speed's seminal atlas, 'The Theatre of Great Britaine'. Vignettes of Ely and Huntingdon. Maps the Great North Road. Strong impression. Description: Huntingdonshire. 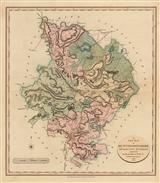 Based on the work of Christopher Saxton, this is one of the earliest available maps of the county. Coloured. 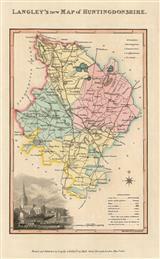 Description: Decorative county map with inset city plans of Huntingdon and Ely. Embellished with heraldic insignia. Coloured. 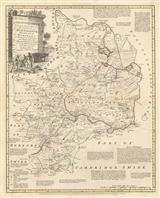 Description: Attractive and rare map of Huntingdonshire with both a large cartouche and a large dedication on the lower corners. 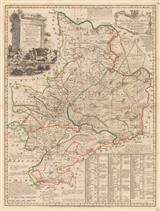 Description: Large, decorative county map of Huntingdonshire with numerous "historical extracts" describing the industries and natural history of the county. Original hand-colour. 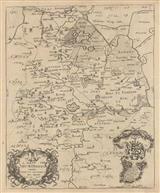 Description: Detailed county map of Huntingdonshire from Bowens landmark survey of Georgian Britain. Original colour. Description: Huntingdonshire. A county map exhibiting its roads, river and parks. Original colour. Description: Huntingdonshire, divided into hundreds and with vignette of St. Ives Church. Original colour. Description: Huntingdonshire. 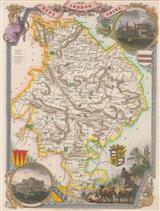 Large, striking county map with a vignette of Kimbolton Castle. Original colour. Description: County map of Huntingdonshire set within a decorative border and flanked by scenic vignettes. Coloured.